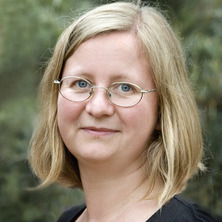 Dr Lisbeth Grondahl's research interests are in the areas of Biomaterials Science and Tissue Engineering. In particular, she works on the development of novel materials and on surface modification of materials for improved bioactivity. Grondahl, Lisbeth and Luk, Jing Zhong (2015). Grafting of functional monomers on biomaterials. In Dietmar Hutmacher and Wojciech Chrzanowski (Ed. ), Biointerfaces: where material meets biology (pp. 312-342) Cambridge, United Kingdom: Royal Society of Chemistry. Chandler-Temple, Adrienne F., Grøndahl, Lisbeth and Wentrup-Byrne, Edeline (2008) Expanded poly(tetrafluoroethylene): From conception to biomedical advice. Chemistry in Australia, 75 8: 3-6. GRONDAHL, L, HAMMERSHOI, A, HARTSHORN, RM and SARGESON, AM (1991) OXIDATION OF THE BIS(1,2-ETHANEDIAMINE)(SARCOSINATO)COBALT(III) ION WITH THIONYL CHLORIDE. Inorganic Chemistry, 30 8: 1800-1805. Exciting new developments at the 5th International Symposium on Surface and Interface of Biomaterials. Chandler-Temple, A., Grondahl, L., Wentrup-Byrne, E. and Whittaker, A. K. (2009). Modification and characterisation of expanded polytetrafluoroethylene. In: 3rd Indo-Australian Conference on Biomaterials, Implants, Tissue Engineering & Regenerative Medicine; in conjunction with 19th Annual Conference of the Australasian Society for Biomaterials and Tissue Engineering, Sydney, Australia, (). 21-23 January 2009. Rai, Bina, Grondahl, Lisbeth and Trau, Matt (2008). Combining chemistry and biology to create stable bio-nanohydroxyapatite towards load-bearing applications. In: 8th World Biomaterials Congress 2008. 8th World Biomaterials Congress 2008, WBC 2008, , , (). May 28, 2008-June 1, 2008. Grøndahl, Lisbeth, Suzuki, Shuko and Wentrup-Byrne, Edeline (2008). In vitro mineralization of phosphate-containing polymers. In: 8th World Biomaterials Congress 2008. 8th World Biomaterials Congress 2008, WBC 2008, , , (). May 28, 2008-June 1, 2008. Grondahl, L., Chandler-Temple, A., Cassady, A. I. and Kingshott, P. (2008). In vitro protein adsorption and pro-inflammatory response to grafted membranes. In: Proceedings of the 8th World Biomaterials Congress. 8th World Biomaterials Congress 2008 (WBC 2008), Amsterdam, Netherlands, (444-444). 28 May - 1 June 2008. Wu, A. C. K., Toulson, S., Pettit, A., Grondahl, L., Mackie, E. J. and Cassady, A. I. (2007). Analysis of in vivo responses to hydrogen peroxide purified PHBV biomaterial implanted in a murine tibial defect. In: Journal of Bone and Mineral Research. Proceedings of: 29th Annual Meeting of the American Society for Bone and Mineral Research. 29th Annual Meeting of the American Society for Bone and Mineral Research, Honolulu, HI, U.S.A, (S265-S265). 16-19 Sep 2007. Grondahl, L, Wentrup-Byrne, E., Chandler-Temple, A. F. and Shah, N. K. (2006). Calcium ion induced grafting of a phosphate containing monomer for improved bioactivity of facial augmentation membranes. In: 28th Australasian Polymer Symposium & Aust Society for Biomaterials. 28th Australasian Polymer Symposium & Aust Society for Biomat, Rotorua, (Abstract). 5-9 Feb, 2006. Grondahl, L (2006). Surface interaction and biomaterials. In: 2006 Australia Brazil Bio Nanotechnology Conference. 2006 Australia Brazil Bio Nanotechnology Conference, Brisbane, (Abstract). 27-28 March, 2006. Grondahl, L. (2005). Characterisation of alginate and hydroxyapatite/alginate beads for drug delivery applications. In: Indo-Australian Conference on Biomaterials, Implantable Devices & Tissue Engineering. Indo-Australian Conference on Biomaterials, Implantable Devicg, India, (Abstract). Jan, 2005. Grondahl, L., Lawrie, G. A. and Cool, S. M. (2005). Characterisation of alginate and hydroxyapatite/alginate drug delivery systems. In: Aust Society for Biomaterials 14th Annual Conference. Aust Society for Biomaterials 14th Annual Conference, Victor Harbor, (Abstract). Mar, 2005. Luong-Van, E. K., Grondahl, L., Chua, K.B., Leong, K.C., Nurcombe, V. and Cool, S. M. (2005). Electrospun polycaprolactone fiber membranes for the sustained delivery of heparin. In: Indo-Australian Conference on Biomaterials, Implantable Devices & Tissue Engineering. Indo-Australian Conference on Biomaterials, Implantable Devicg, India, (Poster). Jan, 2005. Grondahl, L., Wentrup-Byrne, E., Suzuki, S. and Chandler-Temple, A. F. (2005). Improving the bioactivity of a facial augmentation membrane. In: Proceedings of: Australasian Society for Biomaterials 15th Annual Conference. Australasian Society for Biomaterials 15th Annual Conference, Victor Harbor, S.A., Australia, (). 31 March-2 April 2005. Grondahl, L. and Wentrup-Byrne, E. (2005). Improving the bioactivity of a facial augmentation membrane. In: Indo-Australian Conference on Biomaterials, Implantable Devices & Tissue Engineering. Indo-Australian Conference on Biomaterials, Implantable Devicg, India, (Poster). Jan, 2005. Grondahl, L. (2005). Surface modification of biomaterials. In: 2nd ARC Centre for Nanomaterials Annual Conference. 2nd ARC Centre for Nanomaterials Annual Conference, Maroochydore, (Abstract). Nov, 2005. Riding, A. S., Whittaker, A. K., Grondahl, L. and Hill, D. J. T. (2004). Biodegradable foams for biomedical and dental applications formed from supercritical CO2. In: Proceedings of the 7th World Biomaterials Congress. 7th World Biomaterials Congress, Sydney, (Poster). May, 2004. Riding A.S., Whittaker A.K., Grondahl L. and Hill D.J.T. (2004). Biodegradable polymer matrices for biomedical applications using supercritical carbon dioxide as a foaming agent. In: Transactions - 7th World Biomaterials Congress. Transactions - 7th World Biomaterials Congress, Sydney, (). May 17, 2004-May 21, 2004. Grondahl, L. (2004). Bone biomaterial surface engineering. In: Indo-Australian Conference on Biotechnology and Biomaterials. Indo-Australian Conf on Biotechnology and Biomaterials, Manipal, (Abstract). Feb, 2004. Chandler-Temple, A. F., Grondahl, L., Whittaker, A. K. and Wentrup-Byrne, E. (2004). Graft-polymerization of ePTFE with phosphate containing monomers: Investigations of the nature of the surface chemistry. In: 27th Australasian Polymer Symposium. 27th Australasian Polymer Symposium, Adelaide, (Poster). Nov, 2004. Luong-Van, E. K., Grondahl, L., Nurcombe, V. and Cool, S. M. (2004). Heparan sulfate loaded Poly( -caprolactone) microparticles for bone repair. In: 7th World Biomaterials Congress. 7th World Biomaterials Congress, Sydney, (Poster). May, 2004. Chandler-Temple, A. F., Grondahl, L., Cassady, A.I., Whittaker, A. K. and Wentrup-Byrne, E. (2004). Macrophage response to modified ePTFE facial membranes. In: Proceedings of: 7th World Biomaterials Congress. 7th World Biomaterials Congress, Sydney, Australia, (). 17-21 May 2004. Grondahl, L. (2004). Materials for life: Bone biomaterials. In: CONSTAQ. CONSTAQ, Brisbane, (Abstract). Sept, 2004. Wentrup-Byrne, E., Suzuki, S., Grondahl, L. and Leavesley, D. (2004). Surface properties of bioactivated ePTFE membranes. In: 7th World Biomaterials Congress. 7th World Biomaterials Congress, Sydney, (Poster). May, 2004. Russo, M. A., Grondahl, L., Walker, D. O. and Whittaker, A. K. (2004). The use of biodegradable polymers for drug delivery to treat brain tumours. In: 27th Australasian Polymer Symposium. 27th Australasian Polymer Symposium, Adelaide, (Poster). Nov, 2004. Riding, Adrian, Whittaker, A. K., Grondahl, L. and Hill, D. J. T. (2003). Biodegradable foams for biomedical and dental applications from supercritical CO2. In: Andrew Whittaker, Proceedings of the 26th Australasian Polymer Symposium. 26th Australasian Polymer Symposium (26APS), Noosa, Qld, Australia, (). 13-17 July 2003. Wentrup-Byrne, E., Suzuki, S., Grondahl, L. and Leavesley, D. (2003). Improved bioactivity of granted PFTE membranes. In: 26th Australian Polymer Conference. 26th Australian Polymer Conference, Noosa, (Abstract). July, 2003. Chandler-Temple, A. F., Wagner, K., Grondahl, L., Cassady, I.A., Whittaker, A. K. and Wentrup-Byrne, E. (2003). Macrophage response to grafted PTFE facial membranes. In: 26th Australian Polymer Symposium. 26th Australian Polymer Symposium, Noosa, (). 13-17 July, 2003. Matheson, S. C., Whittaker, A. K. and Grondahl, L. (2003). Preparation and properties of phosphate-containing hydrogels. In: 26th Australian Polymer Conference. 26th Australian Polymer Conference, Noosa, (Abstract). July, 2003. Sharrad, C., Grondahl, L. and Gahan, L. R. (2000). Solution studies of the interaction of Mercury(II) with encapsulating ligands. In: XXV International Symposium on Macrocyclic Chemistry. XXV International Symposium on Macrocyclic Chemistry, University of St Andrews, Scotland, (P17-(Abstract)). 2-7 July, 2000. Cusack, R., Grondahl, L., Abbenante, J., Fairlie, D., Gahan, L. R., Hambley, T. W. and Hanson, G. R. (1999). Cyclic peptides as metal ion receptors. In: J. Spencer and A. Brodie, Abstracts of IC'99 Joint Meeting of the Inorganic Division of the RACI and Inorganic and Organometallic Specialist Group of the NZ Institute of Chemistry. IC'99, Wellington, NZ, (21). 31 January - 4 February 1999. Sharrad, C., Grondahl, L. and Gahan, L. R. (1999). Solution studies of the interaction of mercury(II) with an encapsulating ligand. In: J. Spencer and A. Brodie, Abstracts of IC'99 Joint Meeting of the Inorganic Division of the RACI and Inorganic and Organometallic Specialist Group of the NZ Institute of Chemistry. IC'99, Wellington, NZ, (57). 31 January - 4 February 1999.